Recap: I cast Gishath twice, and had a big board, but a Blasphemous Act did us in. It was a fun game. This one went pretty long, as the Allies deck took long turns to figure stuff out and had a Mana Echoes. Kiki-Jiki got a Koth emblem early, had two Valakuts, and got to Karn’s Ultimate range with an Ulamog. There was an All is Dust that also wrecked the board. I didn’t really get to do any thing exciting or fun in the game, just play catch up. Cool things that were on the table for me included a turn 1 Rogue Elephant, a Tusk-Caller up to level 2, and Daghatar got cast twice. Really though, I think this is a game where I would have scooped to speed things up, but I was still sticking with my “No Scooping Resolution,” which made me grumpy. Elephants are amazing animals. There isn’t a non-silver bordered Elephant Legend, so Daghatar gets to be the guy. The rest of the deck is lots of elephants and loxodon, and a few +1/+1 counters things (but mostly just all of the elephants, or things that make elephants). Most people were at really big life. Atraxa had a Mathar’s Crusade out at one point. Clues seemed like a fun game to play. Arcades Sabboth seems like he could be a draconic detective. I can’t remember if I had plans to turn clues into creatures and buff them or what. I know drawing lots of cards was a goal, since I played a Psychosis crawler. I keep a 1 land hand with a Wild Cantor (and draw into a second land on turn 2). I miss a third land drop, but cast a Commander Sphere. Iname plays some spirits and a Royal Assassin, and Meren has a few elves in play. I’m able to Artifact Mutation Iname’s Caged Sun (mostly because I needed some creatures in play), and follow it up with a Sporoloth Ancient and Scatter the Seeds. Iname gets cast and dumps 20+ spirits in his yard. Meren casts some creature that mostly wipes the board, dealing with Doran’s Siege Rhino. I cast a Sporemound, and then follow up with Rith on Turn 7. Iname has a 20/20 Revenant and also a Mikeaus in the graveyard. Meren has a Birthing Pod and starts finding stuff. When I get the chance I’m able to swing and kill Iname over the course of 2 turns. I get an active Beast Master’s Ascension, but I lose Rith (and then am able to recast it). I intend to kill Meren, but I miscalculate. Doran casts a Forgotten Ancient and then uses Aligned Hedron Network to neutralize my team. I misplay my mana and don’t have enough to retrurn and cast a Naya Charm. I draw some cards off of a Psychotrope Thallid. Meren is still hanging on and getting life, via stealing Siege Rhinos with a Sepulchral Primordial, whereas I am losing it, and then dying. About the Deck: I wanted a new Naya deck, and Rith was always my favorite of the Invasion Dragons. I also wanted an excuse to make more poorly (i.e. 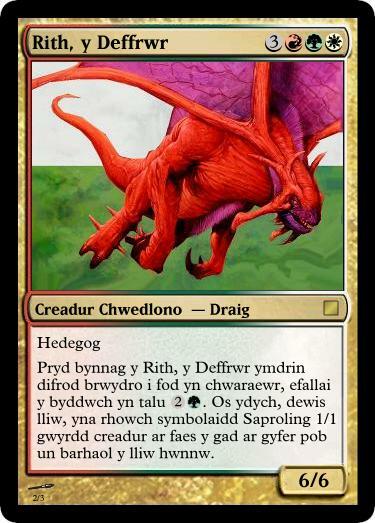 Google) translated Welsh Magic cards. 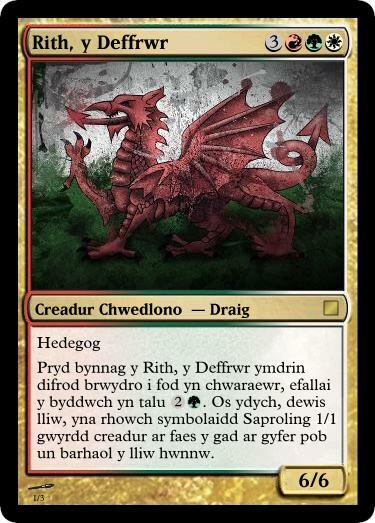 Rith fit the bill well both because the name was transliteratable and because the art could easily be edited to look similar to Y Ddraig Goch. 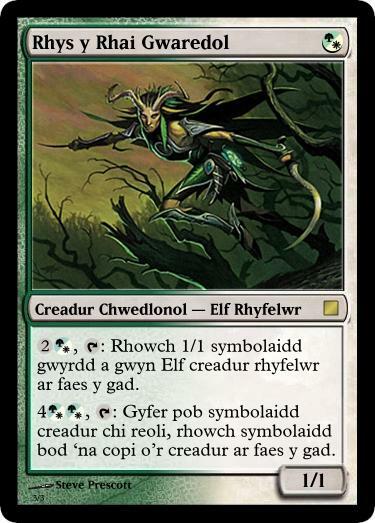 My Rhys the Redeemed is also poorly translated into Welsh (because it’s a Welsh Name and it pisses me off when people pronounce it wrong). The deck has a pretty strong Saproling Theme to it, as well as some color changing effects to maximize Rith’s breath-weapon. It also has the Sporemound/Life and Limb combo for good measure. The Rest of the Night: I did also win a game with my “Creatureless” Soramaro deck. This was my final night playing at the Family Game Store in Savage Mill (in Savage MD) before I moved to Portland, OR, so I wanted to make sure I got at least one new deck played there. I started with 3 land (I think all forests?) but I think I drew into a plains somewhere. I know I was able to Mortify Titania’s early Azusa. Sisay had played Dosan, and Titiania Stripmined an Island from Karona, who followed that with a Mirari’s Wake. I used a Priest of Gix to play a Phyrexian Plaguelord. Sisay dropped a Karametra and Jedit of Efrava. Titania played Exploration, a Zuran Orb and Parallel Lives (which was troubling). Cast Unearth on Priest of Gix to get the mana to play Teneb and then cast Necromantic Selection on the next turn, returning my own Teneb. Teneb harvested a Solemn Simulacrum, and a Deranged Hermit (which helped pay the convoke to Endless Obedience out Jedit). It seemed like I was in a good spot. Sisay started rebuilding with Heroes Podium and Karona was doing things with Tiling Treefolk and Strands of Night. Karona was at really low life but dropped Parallel Evolution, Parallel Lives (up to 72 squirrels) and then a Goblin Bombardment. I play Death Frenzy and Karona casts Riot Control (for 30) in response, and then also Kills me. Rest of the Night: I switched tables with Karona’s player so we could play some last games with Gisa/Ihsan. I played one game with my Tariel and the Seven (Legendary) Samurai deck. I had a Neko-Te on Kumano, Master Yamabushi (which is fun times), I came really close to winning, but Squirrels happened. I ended the night with my very first deck (from this project, and ever, which was recently featured on the Mothership site), Kangee the Aerie Keeper. I don’t really remember what happened in the game, being more focused on one last game with some really good friends. About the Deck: This is just big dumb reanimation. It doesn’t stray far from the theme of it’s commander. Stuff goes to the graveyard, and I get it back. There might be combos, but I don’t even remember. I think it forked from building another deck. NOTE: This game was played at the end of June. I haven’t built any new decks since then due to a cross country move and not yet being settled in permanent housing (I’ve been swapping decks to my backpack from the trunk of my car). I have new decks in the works and found a new place to play. I anticipate recording some new games around October. Finances might keep me from hitting 200 decks as soon as I’d like, but it will happen.